Ensures proper and safe process and instrument operation with instrument self-diagnostics. Communicates in the RS485 or HART mode for remote configuration. 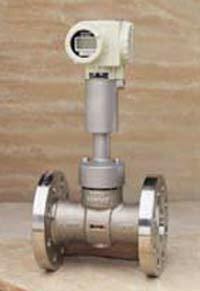 Uses same sensor for all nominal diameters, fluids and process temperatures. Provides local configuration at the meter using external pushbuttons. Guarantees signal integrity by resistance to vibration and thermal shock, continuous self-diagnostics, and extensive electromagnetic compatibility. Ensures mechanical integrity by material traceability, hydrostatic pressure testing, dye-penetrant and weld certification procedures. Displays flow rate in mass or thermal units. Offers models in wafer, flanged, high pressure and dual sensor versions. Provides worldwide safety approvals for applications in hazardous locations. Honeywell Industrial Control, 16404 N. Black Canyon Hwy., Phoenix, AZ 85053. Tel: 800-288-7491; Fax: 512-244-9222.